TheApple on Front Page – Yup, Again! 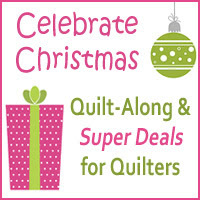 It’s that time of the year to get started with your Christmas Quilt Along’s. 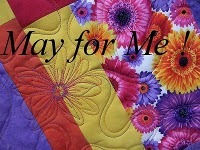 This year I’ll be playing catch up with and eventually participating in the fun quilt along at the Quilting Gallery. When it’s all said and done we’ll all have a collection of 36 different blocks (3 a week for 12 weeks). I’ll be posting my block on November 16th (still have to come up with one…don’t worry – I have a few ideas). There are already 5 blocks posted and today my aunt Barb’s block will be live. 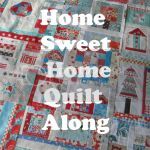 I love quilt-along’s for two main reason – learning new techniques and the fabulous community support that comes along with it. I hope you decide to join along in the fun as well! I’m sure you’ve figured out by now that apple season is in FULL swing. I am finally finding time to post about theApple’s front page appearance at 6:00am EST Sat Sep 17, 2011. I actually DID get to see my typewriter key necklaces up on the front page of etsy as I was quickly updating my Facebook page to let everyone know I would be at the Farmer’s Market that morning. Super exciting! Thank you to magalerie for featuring me in this lovely collection! What a pleasant and fabulous surprise! I have to apologize for how long it has taken me to get this blog post up. I had it mostly written and then of course, didn’t save it so I lost it all. So – here’s try two (and yes, I’m saving – often – this time). I am so in LOVE with the challenge from Crystal S of FrivolousNecessity presented to me and my readers. I was actually just "inspired" by a photograph from a mail order catalog for a future quilt idea and thought that might be kind of fun - everyone picks their own "inspiration" ad photo from a magazine and explains how that created the idea. 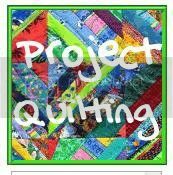 This is my entry in the Project Quilting Off Season Challenge - Catalog It! Your inspiration was to be from an ad. I was inspired by clothes ads. Many times we thumb thru' catalogs and order clothes. Then they come in the mail and they don't fit us correctly. They just hang in our closets. Since this has happened to just about everyone I know, I decided we could all relate! 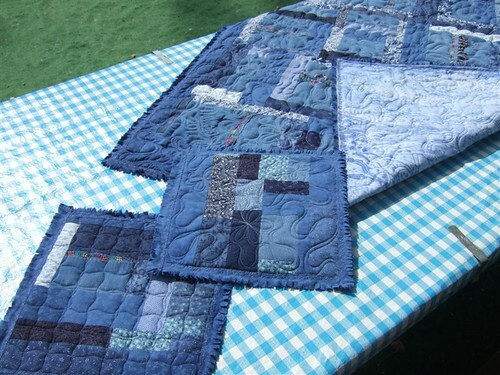 I was inspired to create a quilt from an unusable clothing item --- a denim shirt that didn't fit me! I saw an 'Electrolux' ad and used it as my inspiration for this piece. When I saw all the clothes stacked neatly I immediately thought STRIPES! I also loved the element of the circles from the washing machines in contrast to the stripes. So, I randomly chose striped fabric (and one solid Kona piece) and made two nine patches. I cut them up with the disappearing nine patch pattern and re-pieced them once more. 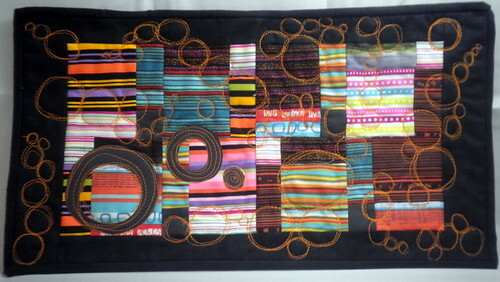 Then, I added a simple black border and appliquéd three circles onto the quilt. Once that was done I used a orange thread to free motion bubble quilting onto the piece. The function of this piece will be an oversized mug rug. I am super happy with the end result! Approximate Dimensions: 17" x 9.5"
I love the ad where the Fons & Porter women make a quilt with George's (one of their husbands) flannel shirts and you see him wearing a shirt with a square cut out of it. 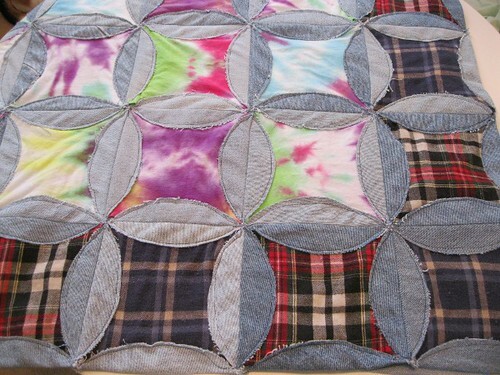 Since seeing that I've wanted to make a flannel and jeans quilt. When I was in college (I mean, uh, middle school... because I'm not that old!) grunge was big. I had a meeting with my dorm's radio exec. board where everyone showed up in jeans, tie-dye t-shirts and flannel shirts. Jeans are upcycled from our personal collection, as are the flannel plaid fabrics. The t-shirts are new and hand dyed by me. All that I dyed were used in the making of this quilt, much to the disappointment of my 5 year old daughter. The pattern was based on this website: www.straw.com/equilters/library/jeans/jeans_gallbaros.html I thought it was a nice way to make a jeans quilt without just making squares. I've used a version of this method before with typical quilting fabric. The quilt is approximately 5ft x 6ft. 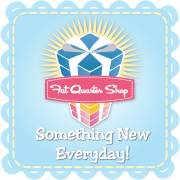 To sweeten the deal for this challenge, Crystal agreed to allow everyone who enters the challenge to be put into a drawing to win a pattern of your choice from Crystals shop FrivolousNecessity. 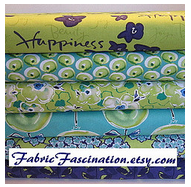 Marcia is the lucky winner of a fabulous pattern from FrivolousNecessity. Thanks to everyone for ‘Thinking Outside of the Square’ with this challenge! Tomorrow is the big day. The Madison Quilt Expo opens tomorrow. The next three days will included 144 informational lectures, 54 stage presentations, 30 sit & sew workshops, 12 hands-on workshops, and a 10 category quilt context and exhibit…let’s not forget about all the fabulous vendors that will also be set up and selling their wares at the show. While you’re enjoying all of the fun things I talked about (including taking a class from my aunt-in-law, Barb Raisbeck of QuiltsbyBarb, on “Long Arm Quilting – What’s Not in the Manual) be sure to look for my quilt, “Spring Convergence” that was accepted into the contest and exhibit! 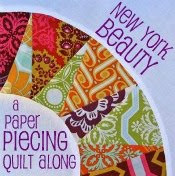 I created this piece for the ‘Large Scale Print’ Challenge of Project QUILTING’s second season. (and yes, those are mirrors in the middle of the yo-yo’s) To read more about how I came up with this piece feel free to check out THIS. 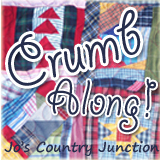 I am absolutely ecstatic to even have one of my quilts hanging in this show! AND, to top it all off – I have NEVER been to the Quilt Expo before since it always happens during apple season. BUT this year, I get to leave the farm early to get a peak at my quilt before the show ends. Yeah! During all the fabulous drama of last week I was in the middle of a custom order request. One of the best selling items in my etsy shop are my matryoshka doll ornaments. This particular customer requested a little Matryoshka Doll for a baby with a matching t-shirt for big sister. It was a really fun custom order and the end result was so adorable! I’m glad it came before I got too busy with the craziness of apple season. I received the goods today, and I'm absolutely delighted! !